I have several of my milking girls who are going to have spring break babies. Along with being excited to meet their kids, I can hardly wait to start milking again! Maybe I’ll have to give their kids cheese names, like Feta, and Mozarella. I also have Astra kidding for the first time, and I think she’s one I’ll be able to milk. She should be a good milker too. This year, I’m also going to try to milk Cutie. I didn’t milk her last year because she had Aphrodite with her. I’m not sure what she’ll think of it, but she is one that passed through the MGIT program and loves her food. That’s a good sign. It has been crazy with the weather and taking care of Tony and everything else, but I do try to do something fun and relaxing after I get done with all my work for the day. 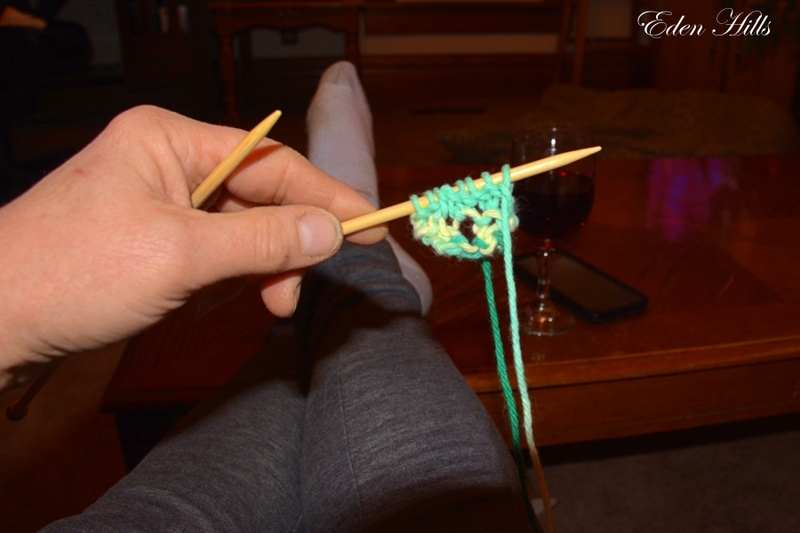 That might be knitting. I’m kind of stuck on dish cloths. 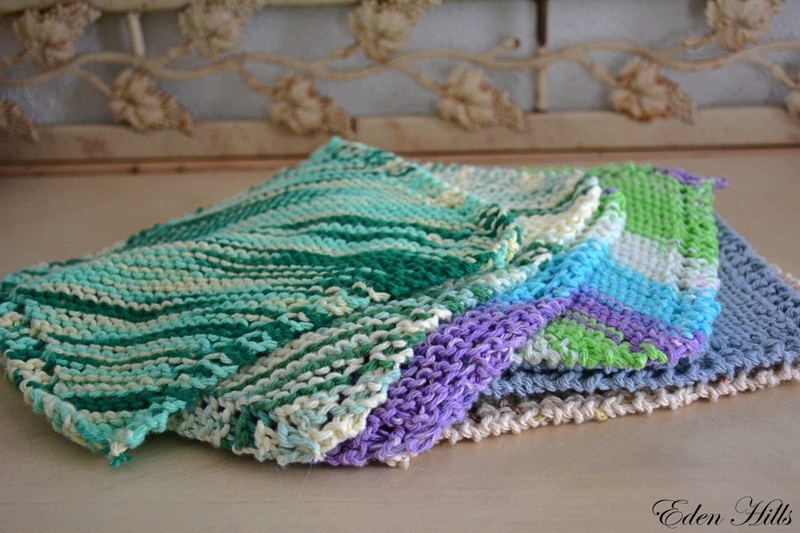 Now I just need to find a new farmer’s market to take all these dish cloths to sell. I did also manage to sneak in making another hat. The yarn beside it will be my next hat. This one actually fits an adult! 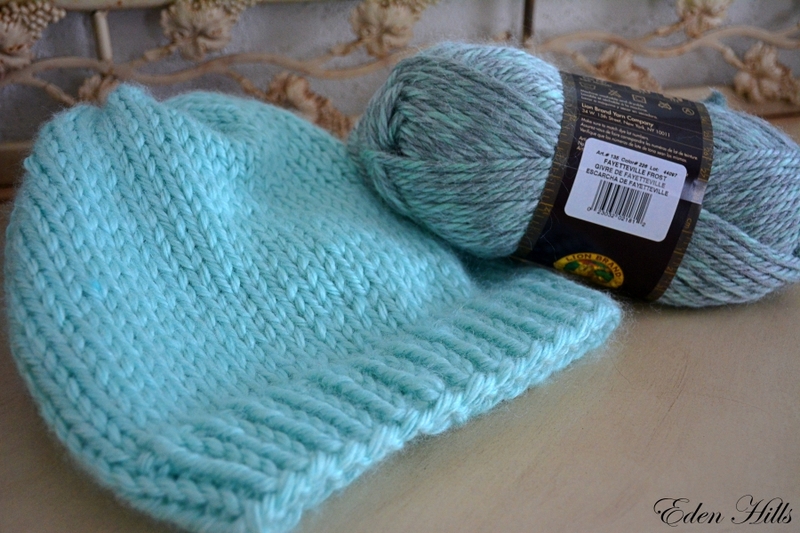 Because so much is going on, this post keeps getting pushed back, so that means I’ve also completed the second hat. I also decided to turn the scarf I made using the rice stitch into an infinity scarf. 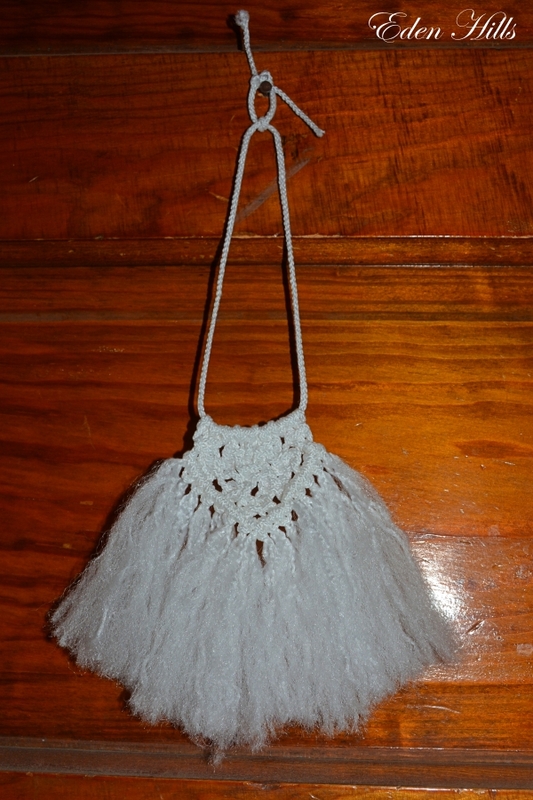 I have to admit it’s because I didn’t want to make tassels. I like this better anyhow. Please ignore the model. I had no other options. Now I’m working on an infinity scarf using the fisherman’s rib stitch. Obviously, I like green. 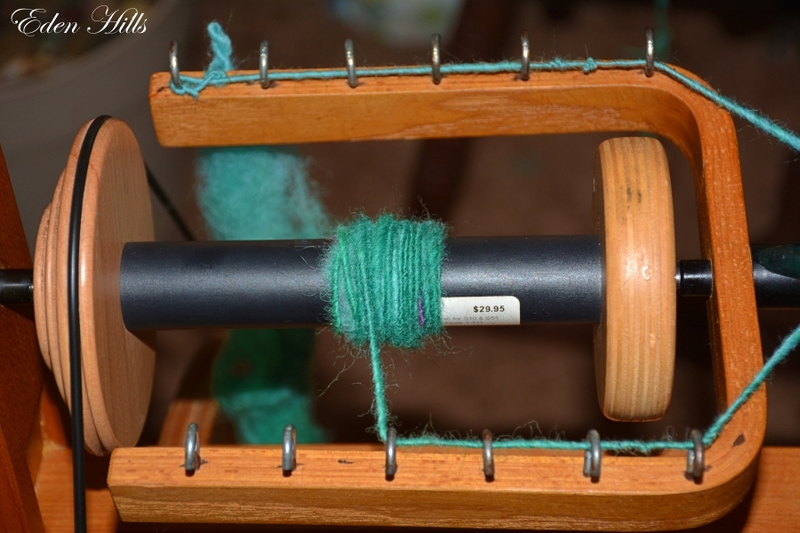 Recently, I’ve added spinning. 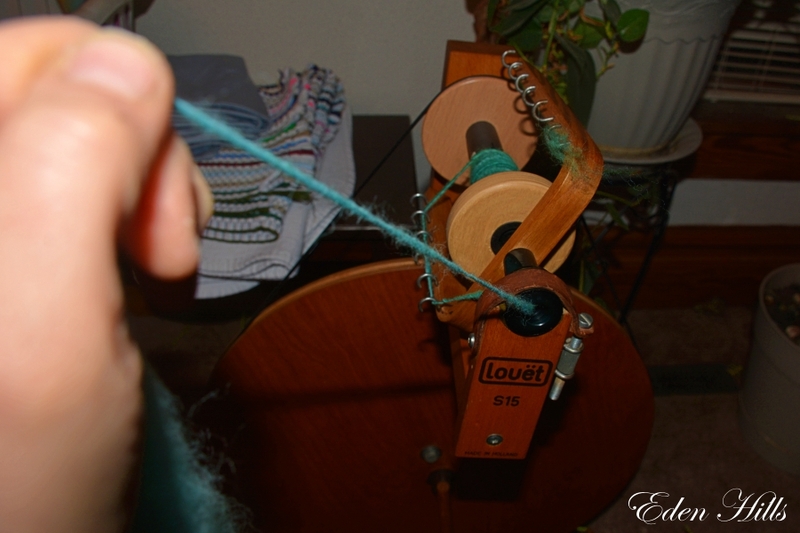 I’m trying to figure out how to use the spinning wheel Claire left for me to learn on. I’m having mixed results with that. I just keep my practice sessions short, so I don’t get too frustrated. 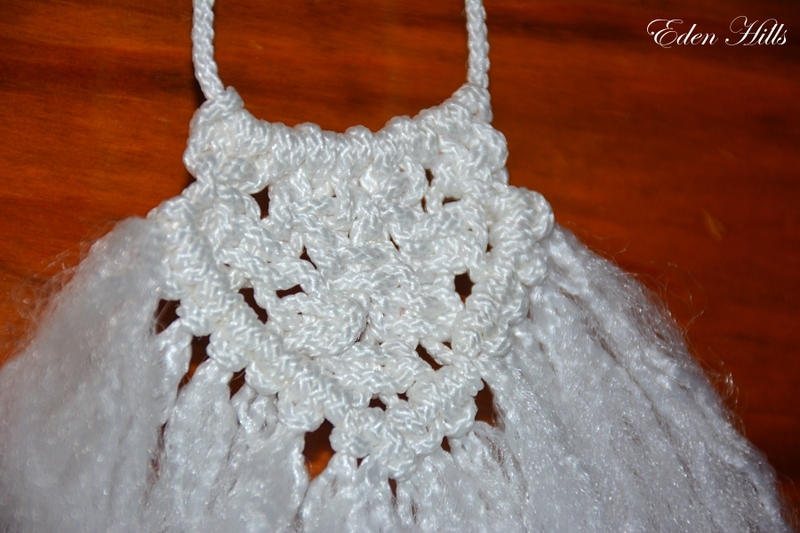 Most recently, I’ve tried some macrame. I shared my feather already, but I am trying other things too. 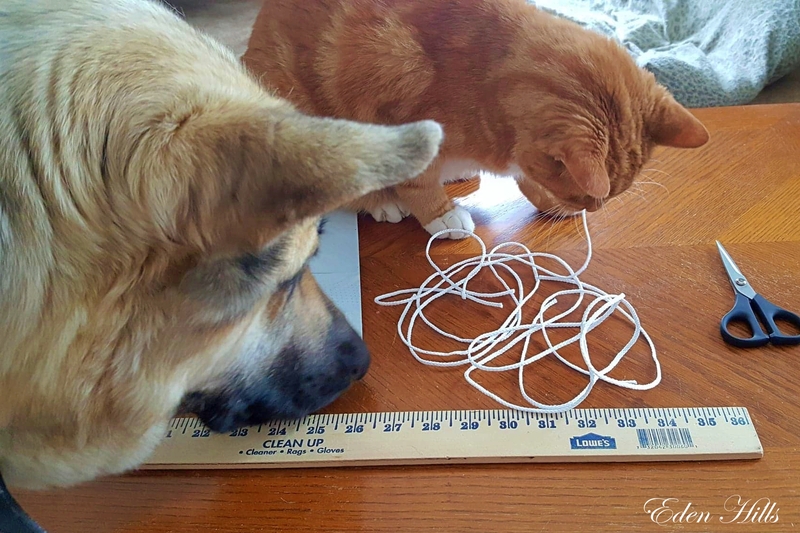 I sometimes have a bit more help than I need. This one was a little piece just to practice the knots and such. I do have plans for this pattern in a bit larger size. I also want to integrate some of the roving from my llamas into macrame projects once I get it back from the fibre mill. I should really quit looking at Pinterest; I already have too many ideas for things I want to try. 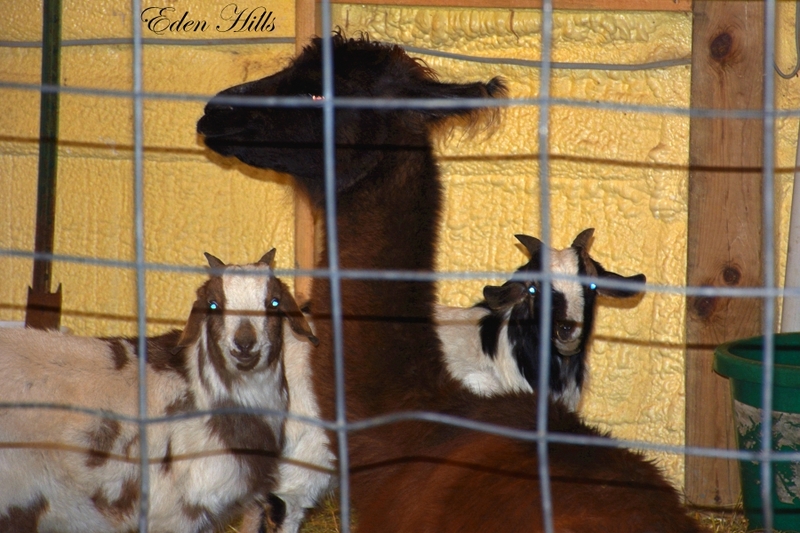 I am going a bit nuts trying to figure out where to put twenty goats to kid all at once over spring break. If it were supposed to be a beautiful normal spring, it wouldn’t be a problem. They could kid outside. That’s not the case though. It looks like it’s going to be cold. So I’m trying to figure out who to put with whom. I think I can have Bonnie, Blaze and Gidget together without any problems. I’m not so sure I can add Bonne and Blaze’s half-sister Mary to the mix though. She sometimes gets along, and sometimes she doesn’t. Then there’s Margarita. She’s little, and I’m pretty sure she will have to be by herself. Sidney, Cutie, and Astra are in the same situation. And I can’t even put two of them together because they would suddenly get pushy with the other one. I’m pretty sure Wanda and Ava, mother and daughter, will be okay together. I’m not sure that will work with Annie and Caroline though. Sometimes, moms don’t won’t their last baby with them trying to still act like their baby when they have new kids coming. Victoria and Clover are three-quarters sisters and get along, but I’m not sure they can be together for kidding. Then there’s the handful of pushy ones that I’m sure have to be by themselves: Joani, Hilda, Haley, Cinnamon, Reva, and Maisie. Oh my. I need another building the size of my garage.